With over 60 million people displaced around the world today, people fleeing persecution suffer at the hands of uncaring governments and exploitative ‘people smugglers’. Our own government in Australia has consistently demonised asylum seekers trying to reach Australia by boat and the people smugglers who transport them. But what if there is a legitimate role for so-called people-smuggling? What if we can show that ordinary Australians would carry out acts of civil disobedience to help desperate people reach safety without exploitation? The issue of asylum seekers and refugees is one of the most pressing public issues facing Australia today. My existing experience of the issue was deepened when I had first-hand experience of the refugee crisis in Germany in late 2015, meeting families who had fled Syria and talking with refugee advocates. After 10 weeks of research and design exploration, here’s my take: we have an apparently unbreakable political consensus between Australia’s two major parties around the widely-condemned mandatory detention, offshore ‘processing’ and boat turn-backs of asylum seekers. 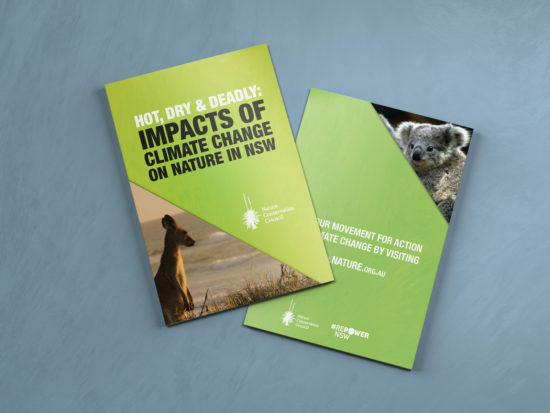 These compassionless policies are continually reinforced with negative, racist and misleading propaganda from government MPs and conservative commentators. My proposal seeks to address this second aspect – the negative attitudes to asylum seekers. 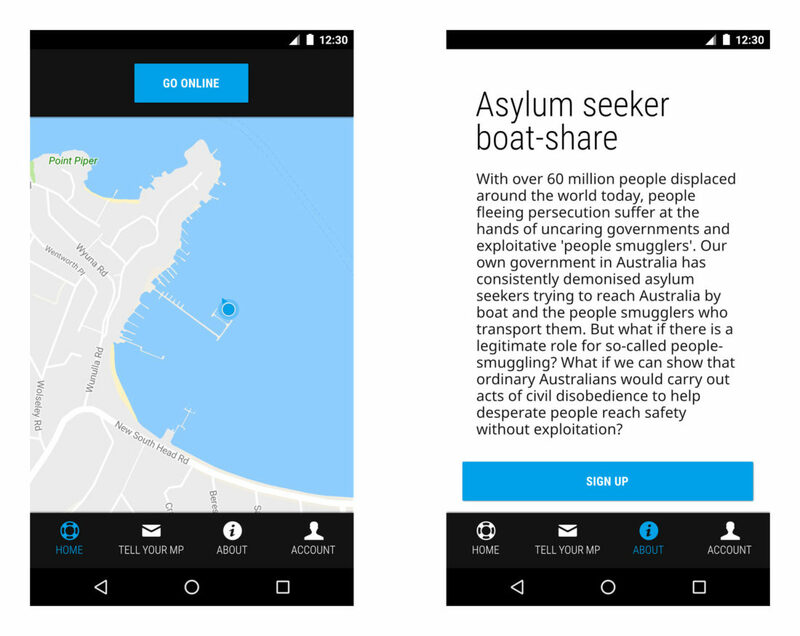 Applying the emergent practice of service design, I propose a mobile app that capitalises on the zeitgeist of ride-sharing services to reframe attempt by some asylum seekers to reach Australia by boat. The app asks, what if there is a legitimate service to be provided? People have a right to seek asylum here, why not help them arrive without risking their lives? 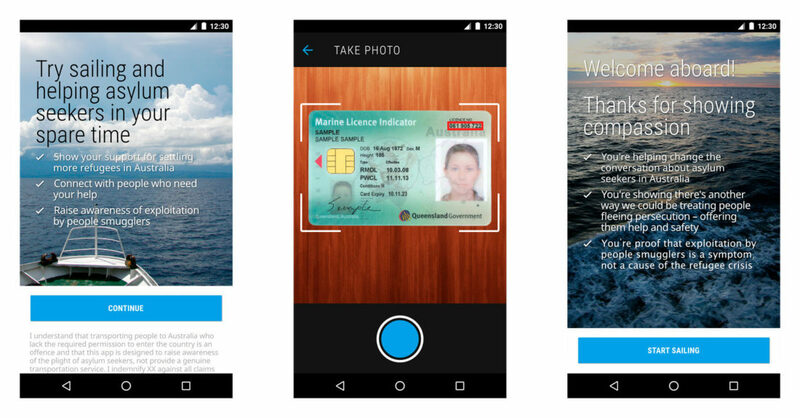 The app works to address a well-documented demand that is well-documented and seeks to surface the theoretical supply by meeting the needs of a specific group of users who want to do something positive to help refugees – boat owners sign up as ‘drivers’ to transport asylum seekers here on a voluntary basis. Of course, this would be illegal to actually carry out, so the accompanying ‘rider’ app for asylum seekers does not form part of this proposal. The purpose of the app is the statement of intent from the boat-owners – and a legitimate service design model that could be used to bring people here safely, if it were allowed. The process of arriving at this service design proposal was informed by diverse research carried out over the past 10 weeks. However, it is most informed by secondary scholarly research addressing the psychological conditions for negative or positive attitudes toward asylum seekers and the implications for communications frames in efforts to change the attitude of a given audience to be more positive toward asylum seekers. The issue-mapping research and problem-space exploration were also key to arriving at this design proposal in that they surfaced the key issue of addressing boat arrivals/turn-backs as central to the issue. Additionally, the emergent practice case study of service design helped me to formulate this proposal by understanding the way in which another service had been designed to address racism and discrimination of immigrants and refugees. 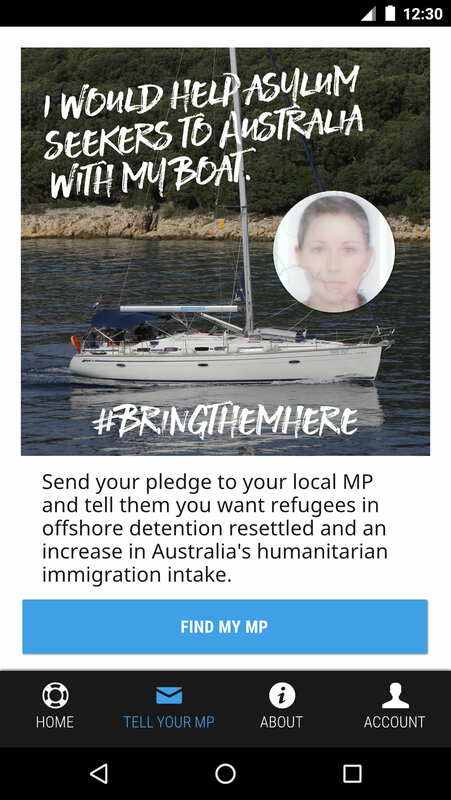 As users, the app is targeting a very specific group of Australians who want to see more compassionate national policies on asylum seekers and also own a boat. While this is undoubtedly a small demographic, my research suggests there would be enough to achieve the desired impact. 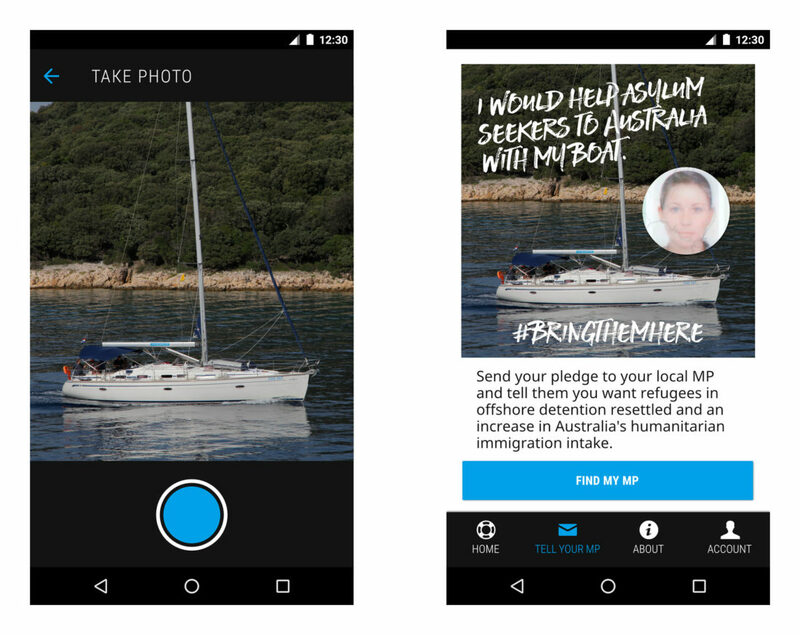 There are three secondary audiences, who are expected to experience the app mostly via media coverage and sharing on social media: first, asylum seekers and refugees – to hear an example of Australians willing to make a strong personal commitment to helping, as a counter to the negative messages conveyed by politicians and the media. Second, people who have negative attitudes to asylum seekers, who would hear an example of others in their communities seeking to help asylum seekers; and finally politicians, to be reminded of the depth of support among Australians who want to see policy change on this issue. The goal of this design proposal is to put another chink in the armour of negative attitudes and public discourse around asylum seekers. My secondary research uncovered evidence that evoking macro justice principles in framing communication around asylum seekers could lead to more positive attitudes toward asylum seekers in the audience. This app and the intention to use it to add to the public discourse through social media marketing, media coverage and direct communication from users to their local federal Member of Parliament invokes these justice principles to talk about the issue by demonstrating that users are making a pledge to share their time and resources so that people with less can be safe and cared for.